This installation is open to the public and able to view on Seaport Common from April 8th, 2019 through April 16th, 2019. A garden of modern art sprouts in Seaport. In a celebratory nod to the Boston Marathon and the arrival of Spring, Seaport commissioned artist Daniele Frazier to create twenty larger than life daffodils that shape shift with the wind and soar at 20 feet tall. 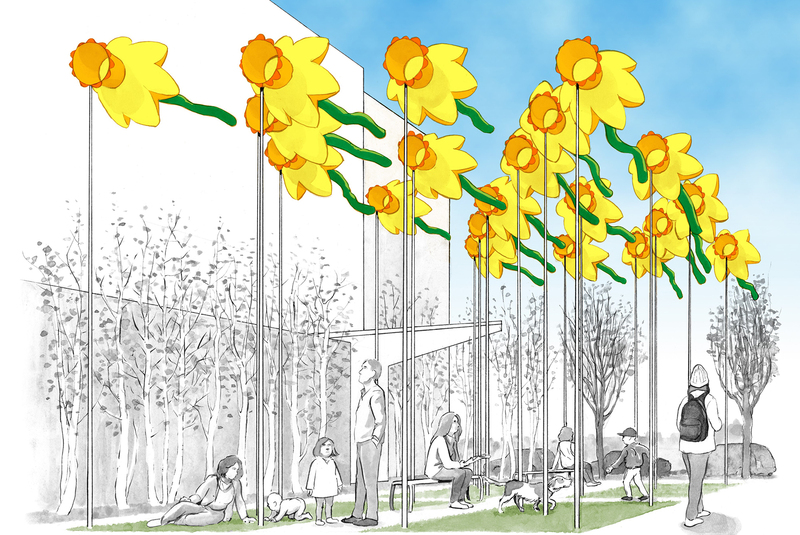 “20 Knots: Daffodils for Boston” will be found in Seaport Common from April 8th, 2019 through April 16th, 2019. This creative work elevates the symbolism behind the daffodil – a flower that not only serves as an expression of springtime, new beginnings, and hope, but one that has also become synonymous with the Boston Marathon and Boston Strong through the work of the Marathon Daffodils. Founded by Diane Valle in response to the tragic marathon bombing, the Marathon Daffodils volunteers mobilize a network of nonprofits and horticulturists to place 130,000 daffodils along the 26.2 mile marathon route. Seaport has partnered with Marathon Daffodils to place daffodils in storefront windows across the district, carrying the visuals of “20 Knots: Daffodils for Boston” throughout the neighborhood, and literally bring the full community into bloom.